Following destructive riots on the Champs-Élysées this Saturday, French Prime Minister Edouard Philippe announced that the government is placing a ban on yellow vest protests in some French cities (Paris, Bordeaux and Toulouse) and will be replacing Paris' police chief, AP reports. 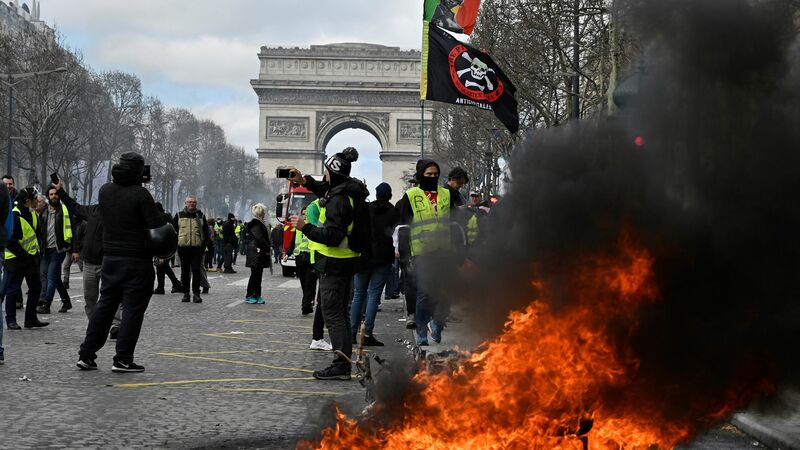 Between the lines: After the 18th straight weekend of protests, the government is seeking new ways to quell the movement amid criticism its police force has been mishandling rioters by not intervening when things turn violent, France 24 reports. French law enforcement tends to shy from direct engagement with protesters to avoid accusations they've used excessive force; instead they favor deploying tear gas. French President Emmanuel Macron has called a summit with his top officials to strategize on how to handle the riots moving forward.